Shiny Celebi in game: 137 Who? Important notice! Pokemon Shiny Celebi is a fictional character of humans. Celebi (Japanese: セレビィ Celebi) is a dual-type Psychic/Grass Mythical Pokémon introduced in Generation II. It serves as the guardian of Ilex Forest and is only able to be caught from the wild in Pokémon Crystal with an event activated by the GS Ball. 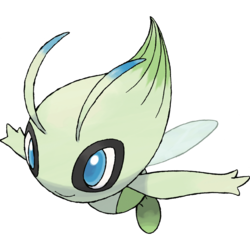 Celebi is the last Pokémon in the Johto Pokédex and Hoenn Pokédex in Generation III, although in the latter, Celebi is not shown. Often found in forests, Celebi is a Mythical Pokémon, known in legend as the "Voice of the Forest." It is able to travel through time and exist simultaneously throughout time, and plant life flourishes wherever it has been. As seen in the anime, it is able to bring deceased Celebi back to life and restore plants to perfect health. It was shown in Pokémon Colosseum that Celebi has the power to instantly cause the Purification of any Shadow Pokémon and can be summoned at Relic Forest with the melody of a Time Flute. Despite living in forests as its guardian, Celebi only shows itself in areas and times of peace. It has been regarded that as long as Celebi are seen throughout the world, a prosperous and bright future is still in store for the Pokémon World. Celebi first appeared in Celebi: Voice of the Forest. A Pokémon hunter was after it and Celebi traveled 40 years into future to escape from him, taking young Sam along with it accidentally. The Iron-Masked Marauder eventually captured the time traveling Pokémon in a Dark Ball and used it to destroy the forest. Ash and Sam managed to snap Celebi out of the Iron Masked Marauder's spell. Celebi appeared in a central role again in Zoroark: Master of Illusions. Grings Kodai was after the Pokémon in order to restore his ability to see the future, which he got on a previous encounter with it. It befriended Zorua and helped save Zoroark after she was mortally injured by Kodai. 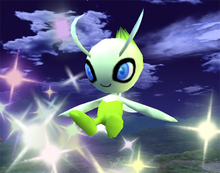 Celebi also made an appearance in Pokémon Chronicles. In Celebi and Joy!, Celebi took Ritchie back in time to help stop the destruction of a Pokémon Center. In The Green Guardian, the Pokémon Ranger Solana accompanied Ash and his friends in helping the Pokémon. A Celebi made a brief cameo in the opening of Jirachi: Wish Maker and Destiny Deoxys. A Celebi appeared in the boss fantasy of A Lean Mean Team Rocket Machine!. Celebi makes a cameo appearance in the beginning of The Rise of Darkrai. A Celebi appeared in another fantasy in An Egg Scramble!. 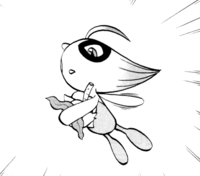 A Celebi made a cameo appearance in the ending credits in Meloetta's Moonlight Serenade. AG155 Celebi May's Pokédex Celebi, the Time Travel Pokémon. Celebi wanders across time as guardian of the forest. Wherever it appears, trees and grass flourish. Celebi appeared in A 'Thank You' That Transcends Time. Celebi appeared in Celebi: a Timeless Encounter. The Masked Man aimed to capture Celebi and use its time-traveling powers to reunite one his Pokémon with its deceased parents. Although the Masked Man managed to capture Celebi, the GS Ball holding it was destroyed by Gold, freeing it from the villain's control. Afterward, it would appear to help in the Ruby & Sapphire and HeartGold & SoulSilver chapters. Shu caught a Celebi in Pokémon Gotta Catch 'Em All but released it afterwards. A Celebi appeared in Celebi, the Green Guardian. A Celebi appeared in TA40. It does not affect the battle, but the thrower of the Poké Ball will earn a bonus and trophy of Celebi. "Celebi has the power to travel through time, and thus wanders from one age to the next. It is considered a deity by the forests: plants and trees are said to grow in unimaginable abundance wherever Celebi visits. Like Mew, Celebi is a Pokémon shrouded in mystery. Its special techniques blend grass and psychic powers." When a Poké Ball is thrown, there is a 1 in 493 chance of Celebi appearing. Like the other "secret" Pokémon, it drops collectible items; in Celebi's case, it drops trophies. "A Time Travel Pokémon. Celebi can travel throughout time and inhabit multiple places simultaneously. It is said that it appears only during times of peace, greeted by a flourishing of grass and trees. Two turns after Celebi uses its Future Sight move, the foe is bombarded with psychic energy. This proves to have a devastating impact on any Pokémon." Celebi appears as a trophy. This Pokémon has the unique ability to travel through time to the past or future. However, the only times Celebi wants to visit are those of peace, so catching sight of Celebi in one of the beautiful forests it frequents is a good sign indeed. Perhaps it's mankind's responsibility to compose the kind of time Celebi would want to visit. Pokémon Ranger: Celebi is in a Ranger Net mission. In the mission, the player must capture the Celebi to save it from the Go-Rock Squad. It is found wandering in Lyra Forest. 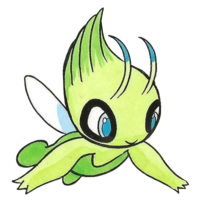 Pokémon Mystery Dungeon: Explorers of Time and Explorers of Darkness: A Shiny Celebi is a supporting protagonist in the main storyline. When the player and partner are sent to the future by Dusknoir, the player, partner, and Grovyle work together to get back to the past. Celebi was the Pokémon who sent Grovyle and the player to the past before, and the trio receive her help to go back again. 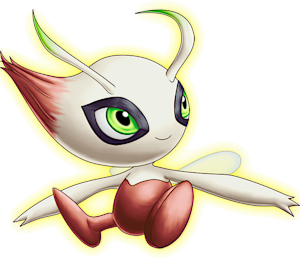 Pokémon Ranger: Guardian Signs: Celebi is the first boss of the game and a main Pokémon in the storyline. It has the power to time travel and can send the player (without the Ukulele Pichu) into the past. It can also send specific Pokémon to the present if the player uses the correct Ranger Signs. Pokémon Super Mystery Dungeon: A regular Celebi appears with Ampharos and Jirachi of the Expedition Society to transport the player and partner out of harm's way before Nuzleaf and Beheeyem get a second chance to petrify the player and partner after their return from the Voidlands. Celebi explains that Dark Matter once threatened to attack the Tree of Life which would have resulted in the planet's collision with the sun, but was stopped by the efforts of a human and a Pokémon. Celebi theorizes this same human was brought back to the present by the ancient Mew. Celebi also reveals that the Harmony Scarves worn by the player and partner were made using materials from the Tree of Life; their temporary evolutions were triggered as a result of the Tree's power. Later, Celebi helps assist many other Pokémon in stopping the ascent of the Tree of Life into the sun a second time. It, along with the Shiny Celebi from Pokémon Mystery Dungeon Explorers of Time, Darkness, and Sky, are recruitable after completion of the main story via the Connection Orb. When Celebi disappears deep in a forest, it is said to leave behind an egg it brought from the future. Revered as a guardian of the forest, Celebi appears wherever beautiful forests exist. Celebi is only obtainable in Pokémon Mystery Dungeon: Explorers of Darkness after downloading a Wonder Mail from the Nintendo WFC. Moves marked with a superscript game abbreviation can only be bred onto Celebi in that game. 51%-100% HP I traveled through time to be with you! 26%-50% HP Oh? My health is halfway down. I'd better be careful. Level up Yes! I gained a level! The power from the future is gaining intensity! Celebi is a mirage Pokémon that summons thorny vines and flits around them. It protects itself with a psychic barrier. It attacks by shooting high-speed leaves. Celebi traveled through time to join the fun in the PokéPark. Celebi wows the crowd when playing Tangrowth's Swing-Along. 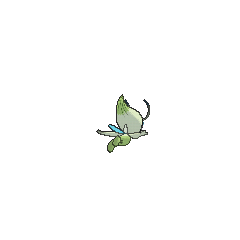 For other sprites and images, please see Celebi images on the Bulbagarden Archives. Celebi was the only Pokémon of the 100 Generation II Pokémon that wasn't used in Pokérap GS. However, it was used in the Hoenn Pokérap along with Mew, another Pokémon that wasn't used in its own generation's Pokérap. During the main story of Pokémon Mystery Dungeon: Explorers of Time and Explorers of Darkness, Celebi is referred to as a female, while it is genderless in the main series as well as on the Mystery Dungeon status screen. 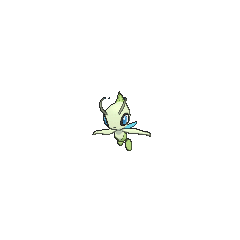 Also, this Celebi is the only Shiny Pokémon to appear in the Pokémon Mystery Dungeon series prior to the WiiWare games. A different non-shiny Celebi appears in Pokémon Super Mystery Dungeon, who is referred to as a male. 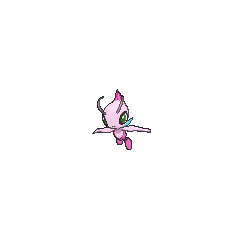 Although Celebi has a Shiny sprite, Shiny Celebi cannot be obtained from Generation III onward. A 2008 interview done with Masamitsu Hidaka revealed that the GS Ball was initially meant to contain a Celebi that would be used in a story arc throughout the Johto series. This idea was shelved, however, and Celebi became the star of Celebi: Voice of the Forest. Celebi is the only Pokémon whose number in the National Pokédex and the New Pokédex are the same: 251. According to a dead Nintendo of Japan page from the early 2000s, Celebi's Japanese name was initially romanized as Selbi as opposed to the later Celebi. Celebi was the first event-exclusive Pokémon to appear in an episode of the anime. Celebi has a natural theme. Celebi might be related to the nature worship of Shintoism. It may be based on a fairy, dryad, or kodama. Celebi may be a combination of celestial and being, or it may be a combination of serenity and 美 bi (beauty).